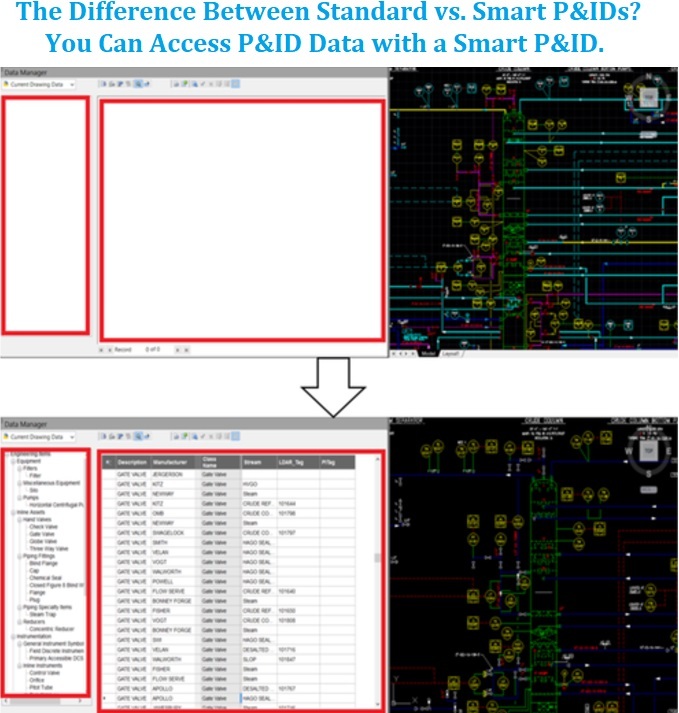 AEC+Compliance Paradigms - Is it Dumb to Have Smart P&IDs? Now, I went into this meeting sufficiently prepared with value propositions, cost-benefit analyses, and the like. I even had an Autodesk Plant Technical Specialist join me to showcase the efficiency, cost-effectiveness, and power Autodesk Plant-3D offers to an owner-operator who integrates its 3D model, isometrics and P&IDs. Slam dunk, right? (especially when Environmental, not Engineering nor CAD is footing 80% of the P&ID bill). Nope – I shot an “air-ball” this time. So, I asked myself (despite all evidence to the contrary): is it dumb to have smart P&IDs? And should a client forgo the P&ID conversion process if they can’t get all departments on the same page? The answer to both is no, of course. Even if every department doesn’t get behind smart P&IDs, there are numerous reasons for a facility to make the leap. Because initial work is required to digitize a P&ID, I refer to a phenomenon called the “P&ID Wall,” i.e., the point beneath which our costs need to fall in order for facilities to be most inclined to make the switch (regardless if they knew it would save them hundreds of thousands in the future). When we first started converting P&IDs in 2008, the cost ran as high as $500 per P&ID! Now, we are pushing the envelope below $100 for P&ID Conversion (an 80% / 5X reduction from then to now). Now, we are pushing the envelope below $100 for P&ID Conversion (an 80% / 5X reduction from then to now). Further, we are poised to deliver comprehensive engineering asset dataset generated from smart P&IDs at $50 per P&ID. And nothing about that is dumb. A wise man and colleague once shared with me the principle of the “Early Adopter Curve” that Silicon Valley accepts in which new products become industry standard after 13.5% adoption. In other words, all it takes is for 13.5% of a market adopting a product for it to escalate quickly to a market standard. We believe that smart P&IDs are the foundation for the plant of the future – operating facilities that leverage big data to drive efficiency, reduce operational expenditures, and mitigate documentation gaps that lead to unnecessary risk. All it takes is 13.5% of the market for innovation to escalate quickly and become market standard. I suppose if that happens, then “smart” P&IDs will be known simply as P&IDs once again. Perhaps then we’ll all ever wonder how we did without them. Still think smart P&IDs are dumb? Feel free to call or email me after checking out this blog that I wrote almost 3 years ago for those of you who are still “non-believers” in smart P&IDs: P&ID DATA (not Diagrams). Otherwise, if you have comments, questions, or contentions – please share! This entry was posted on Saturday, September 9th, 2017 at 10:41 am. You can follow any responses to this entry through the RSS 2.0 feed. You can leave a response, or trackback from your own site.